Get ready for a medieval adventure, here at Easy Slot, with Mighty Black Knight, a 5 reel, 100 payline slot created by slot wizards SG Gaming. Mighty Black Knight is a fun video slot with a medieval theme. The design is very simple, but the addition of 100 win lines certainly makes this one interesting. You'll be hunting for trinkets and treasures around the castle which you can take home. Where are the treasures? You'll find the golden rewards in entertaining features including stacked symbols, wilds, scatters, and free spins round. Now is your chance to become the knight in shining armour. In Mighty Black Knight, you'll sneak around the castle to find secret hidden gems, jewels, and cash. Make sure to not get caught! 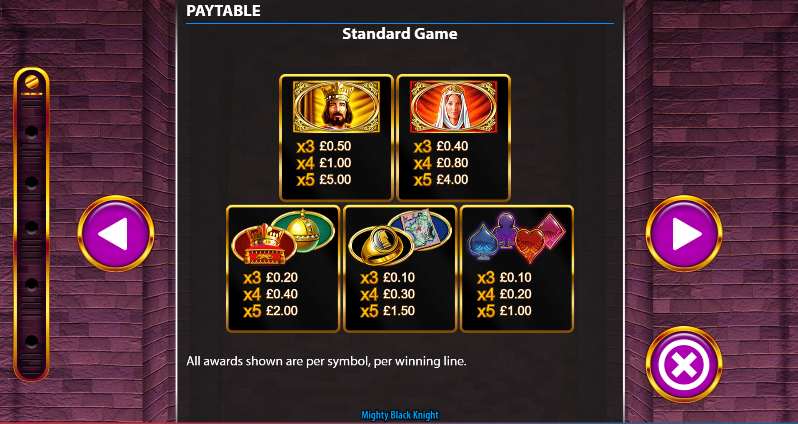 Mighty Black Knight is an entertaining 5 reels, 10 rows, 100 paylines slot created by SG Gaming. The star of the show is the black knight and he is on a mission to bring you some fantastic wins. The design is simple, yet excellently done. Behind the reels, you'll see the grand castle glowing in the moonlit sky. The symbols include spades, clubs, hearts, diamonds, orbs, rings, hearts, maps, and a king and queen. The Wild Symbol - The wild symbol in this slot is the black knight. The black knight can appear anywhere on the reels and replaces all other symbols except for the scatter symbol. Expanding Wilds - When expanding wilds are in play, the top reel will become unlocked and the number of paylines on offer will double. Landing here will also award you will double pay. The wild symbol will also grow and fill the entire reel window. The Scatter Symbol - The scatter is the bonus logo. Landing 3, 4 or 5 scatters will unlock the free spins feature. Here you will be given 8, 12 or 20 free spins retrospectively. The more scatters you land during this feature, the more free spins and exciting prizes you will earn. 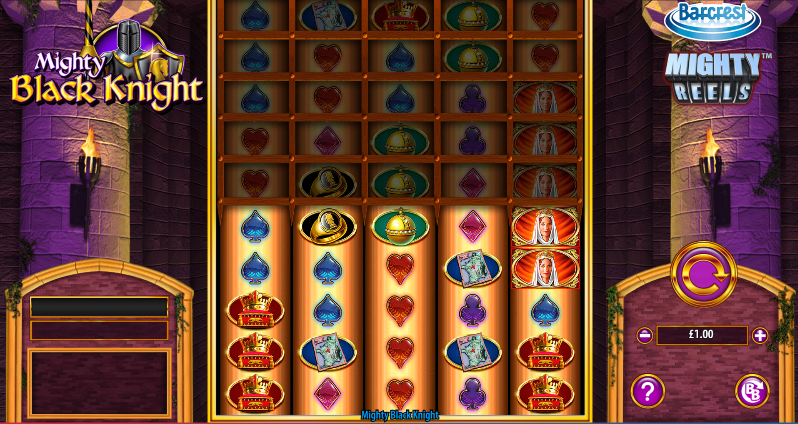 Mighty Black Knight is a great game if you love medieval-themed slots. The design is quite basic, but the addition of 100 paylines makes this slot truly interesting. The expanding reels are perhaps the best feature as symbols can expand to help you win even bigger and better prizes. Play Mighty Black Knight at Easy today.